PopCap Games has struck casual gaming gold with Peggle. It’s a fun arcade-style game that borrows a bit from pinball, a bit from the Japanese game pachinko, and a bit from Breakout. The combination is an incredibly addictive concept lets you wile away hours. The concept is simple: There’s a playfield comprising a series of pegs. You aim a cannon located at the top of the screen and fire a steel ball. Any peg that the ball hits disappears, and gives you points. You must clear the field of orange pegs to continue to the next level. Your steel ball caroms around the playfield, bouncing from one peg to another. A bucket at the bottom of the playfield moves back and forth. If you’re lucky enough to have the ball land in the bucket, it’s a free ball. If not, the ball’s play ends and your cannon loads up with another steel ball. You have a limited number of balls to clear each level. 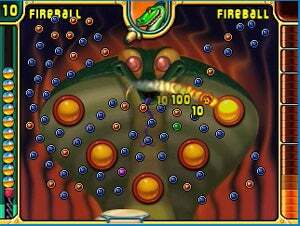 Hitting pegs with the steel ball you fire earns you points in Peggle; your goal is to clear the field and move to the next level. As your ball hits the last orange peg, the playfield transforms. The whole board goes into slow motion as “Ode to Joy” begins to play, complete with drum roll, and when the ball finally lands at the bottom of the screen, it’ll drop in to one of five buckets worth anywhere from 10,000 to 100,000 points. Your successful completion of the level nets you a fireworks display and a rainbow. It’s one heck of a payoff. The game features multiple play modes, and it makes sense to run the Adventure mode first, because that will gradually introduce you to Peggle Masters—animated characters, each of whom introduce you to a special power-up ability, such as multiballs or flippers, explosions and so on. The special abilities are unlocked when you hit a green peg on the board. There are also purple pegs that multiply your score. The reason I suggest playing through the Adventure mode first is because successfully completing levels here enables you to unlock the masters in different game modes. There’s Quick Play, which lets you select any of the dozens of game fields; Duel, which lets you take on either a computer-controlled opponent or another player (by handing off the iPod to someone else); and Challenge, which, once you’ve completed the Adventure mode, lets you test your skills by completing 75 advanced challenges. One thing I did notice, however, is that the game bogs down at points—I saw some frame rate drops on my fifth-generation iPod (away from the final moment after you clear all orange pegs, which drops into slow-motion anyway). Having said that, it doesn’t diminish the game’s fun, because this isn’t happening while you’re doing anything to interact or control the game—it just affects how fast it takes for your ball to fall through the maze. Peggle is inarguably one of the two best games you can download for your iPod right now (the other being Harmonix’s music game Phase), and totally worth the $5.